From 4K footage to livestreaming, we're using our phones to record more video than ever before. But while the visual quality of our phones' cameras has gone from strength to strength, their audio recording capabilities have remained limited by tiny built-in microphones. What's needed is a quick and easy way to record better audio, and these Ambeo Smart Surround prototype headphones from Sennheiser, unveiled at CES 2017, are about as convenient as you can get. 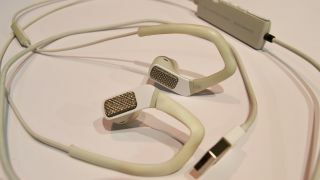 Each earphones bud includes a microphone that record audio in binaural stereo, which is then passed to the phone via its data port. The prototype we used had a USB connection that was plugged into an iPhone via a lightning adaptor, but a representative from Sennheiser told us the final version should plug directly into the phone itself without the need for an adapter. Then, once the audio has been recorded, you can listen back to a clip using headphones and gain a surprisingly competent surround sound experience. It was only after listening to such a clip that we realised just how poor the audio quality in most phone-recorded clips are. In contrast, using the earphones, you really got a sense of the place the clip was recorded in from the audio alone. One of the demos we experienced was a panning shot of Leicester Square. As the camera panned past a street busker, you heard the audio seamlessly transition from right ear to left, and then to behind you as the busker disappeared from view. Of course, this kind of audio style is not going to suit every type of video. If you're recording someone speaking directly to the camera then you're unlikely to want much ambient noise for example. So too will you need to be careful with your head position while you're recording, since you'll need to keep your ears level with the camera in order for the surround sound effect to work. But for the kinds of short videos that are often filmed on a phone, the two mic setup appears to work very well, and gives a quick and easy surround sound recording that doesn't require you to even think about where to place your microphones. It's the perfect way of recording audio that's exactly as you heard it yourself. Sennheiser is yet to announce an official launch date for the Ambeo Smart Surround headphones, and nor has it decided on a final name, but we're hopeful that these new headphones become an essential purchase for anyone who films video on their phones.